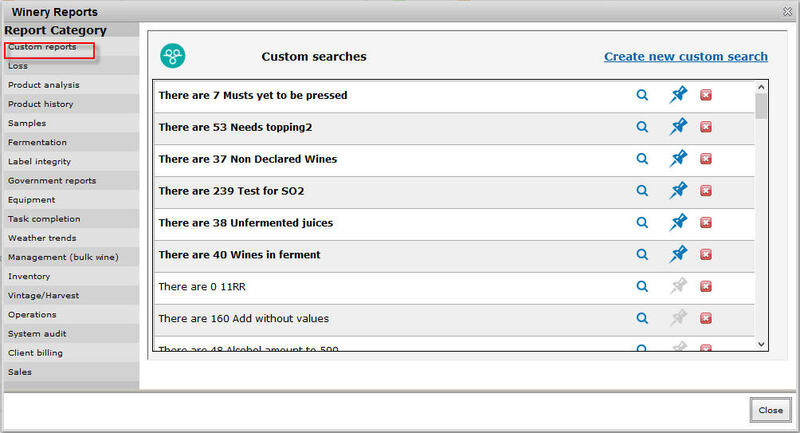 The Bulk wine search allows you to quickly locate bulk products by common search criteria such as Batch code, Batch owner, Vintage, etc. Once you have your search results, you can then request lab work, chart lab results, create work orders and export your results to Excel or PDF format. You can also save your search criteria so you can reuse it later. 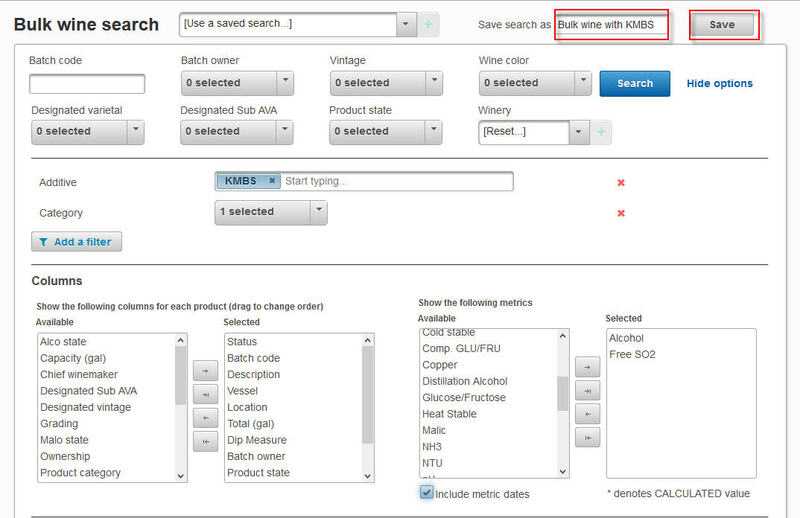 You can access the Bulk wine search by clicking on Search Menu > Advanced Searches > Bulk Wine Search. 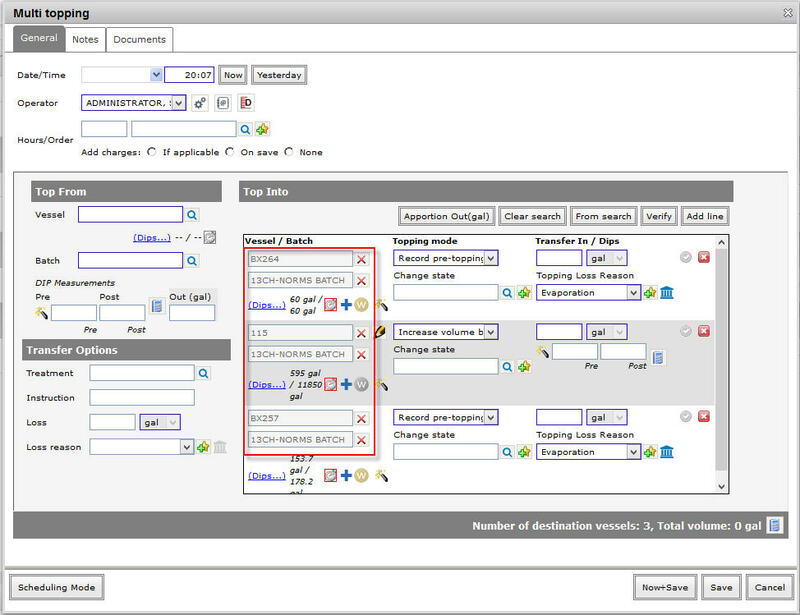 In the example below, we have added the Additive filter. 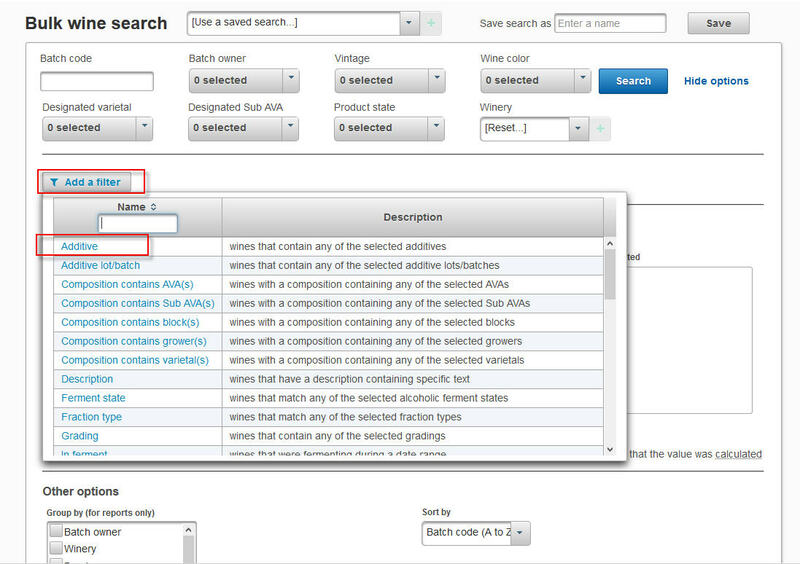 You can add multiple filters to your Bulk wine search and a description of each filter is provided. After you have selected your filters, click on Search button to see the results in a table format. You can change the columns displayed in the search results table by clicking on More options and adjusting the Columns section. The Selected section is the fields that will be output in the result. Simply highlight and click the Right Arrow or drag and drop to select that particular field. You can also add metrics (lab results) to the search results table to see the latest results for your wines. 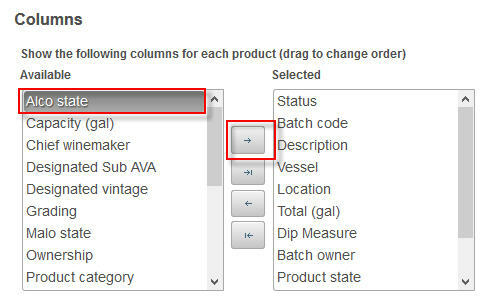 Once you have a list of products from your search results, you can request lab work, chart lab results, start transfer operations, and create work orders by clicking on the products you want to select then click on the Actions button on the lower left corner of the Bulk wine search screen. In the example below, we have selected Multi topping. The Multi topping screen is then brought up, prepopulated with the vessel/batch information of the products that were selected. 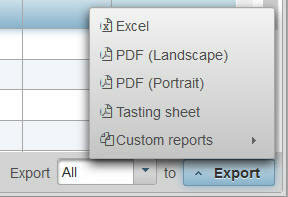 You have the option to export the bulk wine search results to Excel, PDF, tasting sheet, or to a custom report. 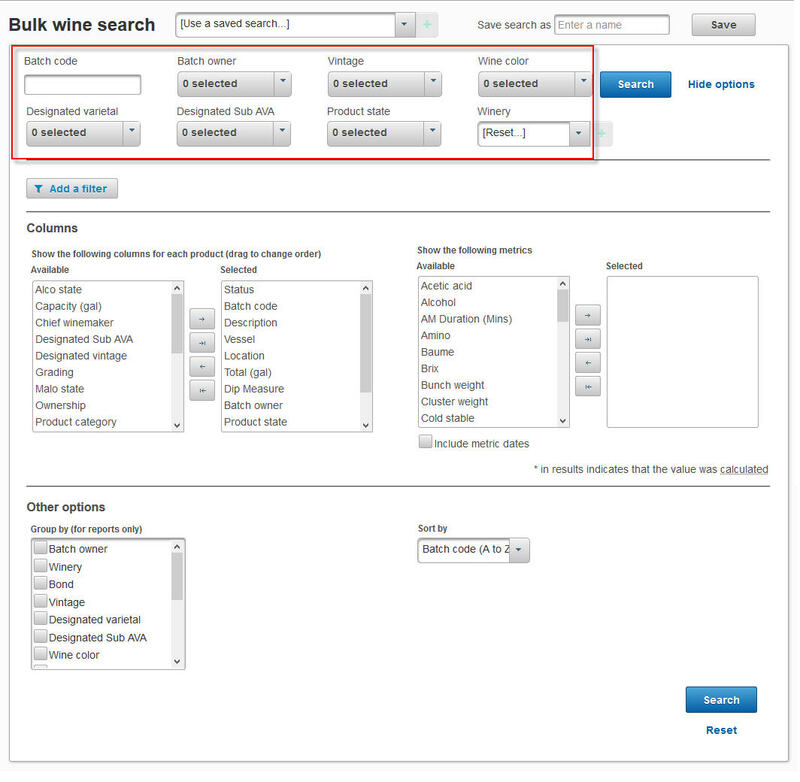 You can do this by selecting your export preference either All, This Page, or Selected in the lower right corner of the Bulk wine search screen. Then select the format you want to export the search results either Excel, PDF, Tasting sheet, or Custom reports (for customers with custom reports enabled). You can then use your saved searches by selecting them from the saved search dropdown menu. Your saved search will then appear in the My Searches dashlet in your desktop. All the saved searches are available in Reports console > Custom reports. 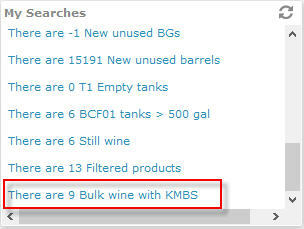 Clicking on the Search icon or on the report name will bring you to the Bulk wine search screen.